My time in this program has provided me with the knowledge I need to continue to pursue the research questions I am passionate about, and I look forward to being able to employ the interpersonal and research skills I’ve learned in future interdisciplinary research projects. 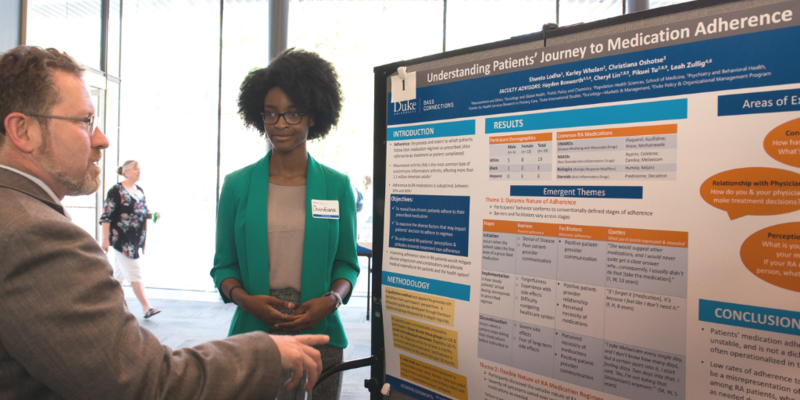 When I first joined the Patients’ Journey to Medication Adherence project team, I never imagined I would be so privileged to witness the development of a research project from the generation of the research question to the recruitment of study participants and analysis of collected data through the fruition of a research poster and a research paper. I joined this project team with the goal to expand upon the knowledge of medication adherence I’d developed from research I had previously conducted, which had explored medication adherence in patients with cardiovascular disease. I looked forward to the opportunity to spend a year investigating a research question I had been given the responsibility to develop and explore. Our team decided to research the medication adherence behaviors of patients with rheumatoid arthritis (RA). Existing literature reports that patients with RA have medication adherence rates ranging from 30% to 80%, and while these rates are less than desirable, the literature does not explore in depth the possible reasons for this reality. We believed that the patient perspective was important in rounding out the reasons why patient medication adherence rates are so low, so we employed qualitative research methods, conducting a mix of focus groups and individual interviews, to understand the medication adherence behaviors of RA patients. RA is a condition characterized by pain and inflammation, which is merely a symptom of the fact that an individual’s immune system is attacking itself, leading to the degradation of joints and limited physical mobility over time. RA was different from the other disease contexts I’d researched in the past in that RA is a disease that remains largely unseen, so individuals often suffer from crippling pain, stiffness, soreness and inflammation while still looking healthy. I learned that this reality affects how RA patients move through life and that it is often hard for them to explain their conditions to others because there’s no outward “physical representation” of the sickness they internally experience. These realities prompted me to reflect on a larger idea of how Western notions of medicine rely largely on physical explanations to validate the occurrence of illnesses. This way of explaining illness – as a physical manifestation – removes possibilities that an individual can be ill without always showing physical symptoms. While there are efforts in the West to shift from these perceptions of illness, this sentiment still pervades how we, as regular people, relate to one another and discuss illness. I remember conversations with multiple participants, who discussed how difficult it was to explain to friends why they had to cancel social events because these individuals would react in disbelief or remark that their friend did not look sick. The frustrations of these participants caused me to think about how this may be a similar reality for individuals with other “invisible” illnesses, namely mental health illnesses among others, and how their disease experience can be unintentionally invalidated because their symptoms don’t meet the physical criteria individuals and structures in society evaluate them with. As I grappled with these perceptions of illness, I was also challenged by the demands of our project. I’d previously never worked so intimately with individuals on a long-term group project, and my experience working with the two other undergraduates and with the professors taught me the importance of communication and of having an open mind. There were five or more individuals at every team meeting and often times individuals’ voices can be lost among the desire for some to communicate their ideas. I learned that having an open mind is necessary to preclude any internal presumptions that can interfere with your ability to understand and accept the advice, feedback or instructions you receive from individuals on your team. As I continued to work with my team, I began to realize how unique my Bass Connections experience is. Few individuals are fortunate enough to work through all aspects of developing and conducting a research project in their undergraduate career. Additionally, I’ve had the opportunity to form relationships with my project leaders, who are professors and experts in the field of health service research, policy and management and market research, and from these relationships, I’ve gained mentors and gleaned wisdom on how to navigate academia and the working world in a respectable and diligent manner. One of the hallmarks of the Bass Connections program is its interdisciplinary nature, and it is within this context that students are able to interact with researchers and professionals we otherwise would not have been able to meet at this stage in our careers. I must admit that I took this reality lightly when I first entered this program. I could not believe that my project leaders could be so invested in my Duke career and in my future, but I am so thankful that they’ve provided so much guidance and mentorship as I’ve worked on this project. The Bass Connections program has largely enriched my undergraduate experience thus far. My time in this program has provided me with the knowledge I need to continue to pursue the research questions I am passionate about, and I look forward to being able to employ the interpersonal and research skills I’ve learned in future interdisciplinary research projects.